My daughter is a cheesecake purist. You can make any flavor, but she'll always prefer a plain piece of very dense cheesecake served alone or with fresh strawberries and whipped cream. Since this is her favorite dessert, I have too make the best one I can. You, too, can make the perfect cheesecake using the below tips. Bring all ingredients to room temperature before mixing. This usually takes thirty minutes. To soften cream cheese in the microwave: place unwrapped 8 oz. cheese in a microwavable bowl and microwave on high for 15 seconds. Add 15 seconds for each additional bar of cheese. Mix filling only until combined. Don't over mix. Use a spring form pan so that the sides can be removed. Butter sides or use a metal spatula around the edges immediately after removing the cheese cake from the oven. Place spring form pan on a shallow pan, like a pizza pan , or cover bottom and up one inch around the sides with aluminum foil to avoid leaks in the oven. Place a shallow pan of water in rack below cheesecake to keep oven moist. Don't open oven door while baking. A perfectly baked cheesecake will be puffed around the edges. When shaken, about an inch in diameter in the center should jiggle. Cool slowly (about an hour) on a wire rack, away from any drafts. Store in the refrigerator, loosely covered, for up to four days. The bottom of the pan can be removed from the cheesecake once the cake has firmed in the refrigerator. Use two spatulas to move cake to serving platter. Garnishing a cheesecake should only be done within 1 to 3 hours of serving. Cheesecakes taste best when brought to room temperature. This takes about 30 minutes. Securely wrap an already firm, about 4 hours in the refrigerator, cheesecake to be put in the freezer. 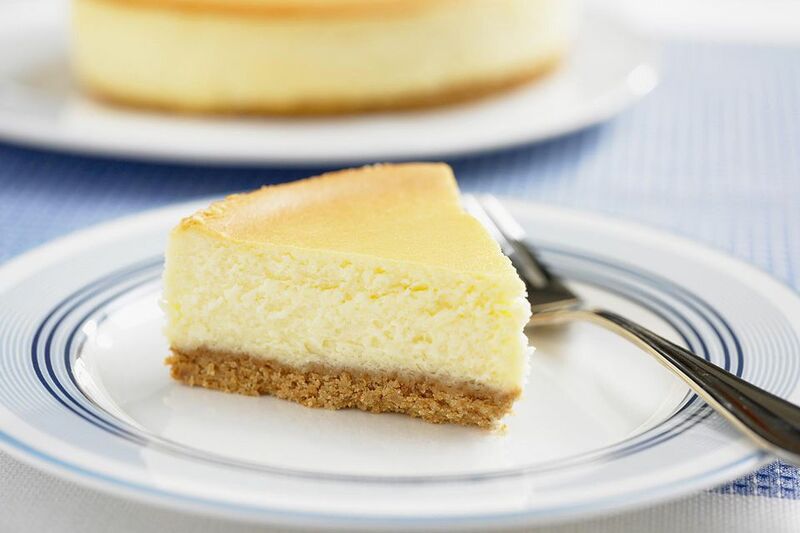 Cheesecakes can be kept for up to 2 months in the freezer. Thaw frozen cheesecake overnight in the refrigerator.